Following reports yesterday that NBC News' chief foreign correspondent Richard Engel had disappeared along with his production crew shortly after entering Syria through Turkey, it was confirmed today that they had indeed been held hostage by unidentified captors until being freed following a firefight that took place yesterday. 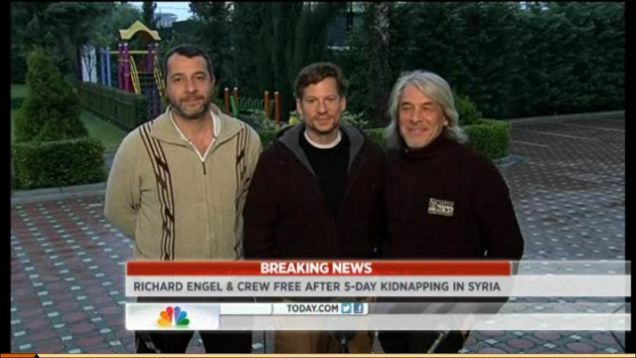 After being kidnapped and held for five days inside Syria by an unknown group, NBC News Chief Foreign Correspondent Richard Engel and his production crew members have been freed unharmed. We are pleased to report they are safely out of the country. In an interview on this morning's Today Show, Engel recalled being ambushed by 15 gunmen who bound and blindfolded him and his crew. Over the following days, they were subjected to mock executions and had been repeatedly moved from one location to the next. It was during one of these transfers that the captors were stopped at a checkpoint being run by members of the Ahrar Al-Sham brigade, an anti-Assad militia, and a firefight ensued. Two of the captors were killed, and the rest fled the scene. Neither Engel nor his colleagues were harmed during their ordeal. 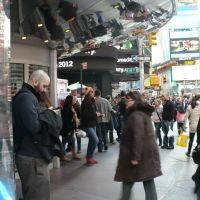 Though their identities have not been confirmed and no official claim of responsibility has been made, Engel said he believes his abductors were members of a pro-Assad thugs who planned to exchange him and his crew for Iranian and Lebanese agents.